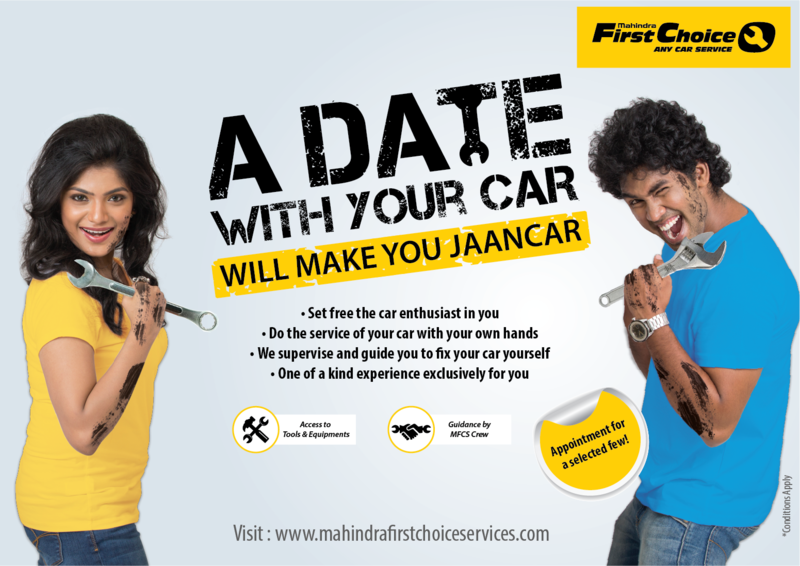 March, 2018: Mahindra First Choice Services (MFC Services), India’s largest chain of multi-brand car service workshops, and part of the USD 19 billion Mahindra Group, has launched a unique initiative ‘A Date with your Car’ that will set free the car enthusiast in you. This one-of-a-kind experience will give car owners an opportunity to service their cars themselves. The idea behind ‘A Date with your Car’ is to give customers a hands-on experience of their cars under the guidance of MFCS technicians and to empower them with the information they need when making car-servicing decisions in the future. The car owners can come to the workshop on an appointed day and service the car themselves. Throughout the session, trained MFCS crew will be available for consultation and help customers fix their car. Customers will also get access to all the tools and equipment needed for undertaking the service job (under MFCS guidance) and no labour cost will be charged. This program will only undertake regular and basic work. To participate in this exclusive appointment-based activity customers can log on towww.mahindrafirstchoiceservices.com for registration. The company also provides cashless insurance facility with leading insurance companies and a convenient booking service for customers. Car owners can book a service either by calling the workshop or the toll-free number 1800-22-4008 or through the websitewww.mahindrafirstchoiceservices.com. The website offers a host of features like car dent estimator, roadside assistance and warranty beyond warranty. Mahindra First Choice Services (MFCS) is a wholly owned subsidiary of the USD 19 billion Mahindra group and is India’s largest chain of multi-brand car workshops with over 340 workshops, present in 250+ towns across 24 states. Marching towards its vision - to be amongst the top 3 service providers for out of warranty cars by 2018, MFC Services is aggressively making inroads in the Indian car service market, which has historically been shared by OEM dealers and Independent Garages. The company aims to establish a country wide network of over 1000 workshops. MFC Services entered the business of private label spare parts for all brands of cars under the ‘MFC’ brand name. MFC Services has also launched a unique digital initiative, Carworkz - an innovative car servicing workshop aggregator. Targeted at all car owners, this mobile and web-based platform, enables them to find the best and nearest workshops for servicing their car. They can get service estimates through the innovative service estimator tool, avail of exclusive offers and conveniently book appointments on the go. Period Cramps aren’t a hassle anymore! दोस्ती बँड सुरांच्या कसोटीला खरा उतरणार का? Yami’s new fitness obsession, Pole Dancing! !